Bergen is located in more temperate southwestern coast of Norway and occupies the peninsula of Bergenshalvøyen. It is thanks to this position on the peninsula that Bergen boasts the warmest temperatures in the country. The city is sheltered by the North Sea by the islands of Askov, Holsnoy, and Sotra, and is the climate is largely mitigated by the warming influence of the Gulf Stream. The weather in Bergen does not have any extremes. The local climate is mostly oceanic, with mild winters and pleasant cool summers. Despite its northern latitude, the weather in Bergen is considered mild, at least by Scandinavian standards. However, the weather in Norway as a whole is still colder than most other European countries. Also, because of it’s proximity to the North Sea, the weather is always changing, so you can often catch a glimpse of sun on rainy days, which happen frequently in Bergen. When the rain stops, smiles break through as quickly as the sunlight, when locals take to the streets and parks. The summer months of July and August are warm enough for tourists to don summer shorts and T-shirts. It is the "hottest" time of year with temperatures climbing to a pleasantly mild 21 degrees Celsius. Temperatures can scale a little higher, but this is not the norm. Rainfall in Bergen throughout the season is still relatively high at 150 millimeters per month but is still considered low in comparison to precipitation in upcoming winter months. What to Pack: Although you may still need to bring a light sweater for overnight lows (in the low 50s), you'll also want to bring swimming gear and a variety of lighter clothing since summer is the warmest and driest time of the year in Bergen. Summer warmth and dryness quickly give way to the chill and higher rainfall totals of fall, with temperatures decreasing steadily from mid-September through the start of winter. Despite an average temperature of 44 degrees Fahrenheit and an average of 20.75 days of rain per month throughout the season, fall is a great time to visit Bergen due to its plethora of festive autumnal events and beautiful fall foliage to discover. What to Pack: The later in the season you travel, the more layers and warm articles of clothing you'll want to bring to prepare for the colder and wetter weather. By mid-October, you should leave the bathing suit behind in favor of a light jacket, and by late November, you may need to bring a winter coat. Be sure to pack a variety of clothing you can layer in order to accommodate for the volatile weather of this season. During winter, temperatures in Bergen will usually remain just above freezing point, but the Gulf Stream’s influence can even increase temperatures to a bearable 8 degrees. However, it is not all smooth sailing. Windy conditions in high humidity will make the city feel much colder than it actually is, so come prepared with an arsenal of winter warmers. Snow falls in Bergen every odd day or so, but hardly accumulates more than 10 centimeters. Compared to the rest of the country, the snowfall is nothing to get excited about. What to Pack: A heavy coat, waterproof shoes that can handle snow, and outerwear like gloves, earmuffs, and knitted hats may be required, especially in January and February when the temperatures are at their lowest and the probability of snowfall is at its highest. Thermal underwear, thick or woolen pants, and a variety of sweaters can go a long way to keeping you warm this season. 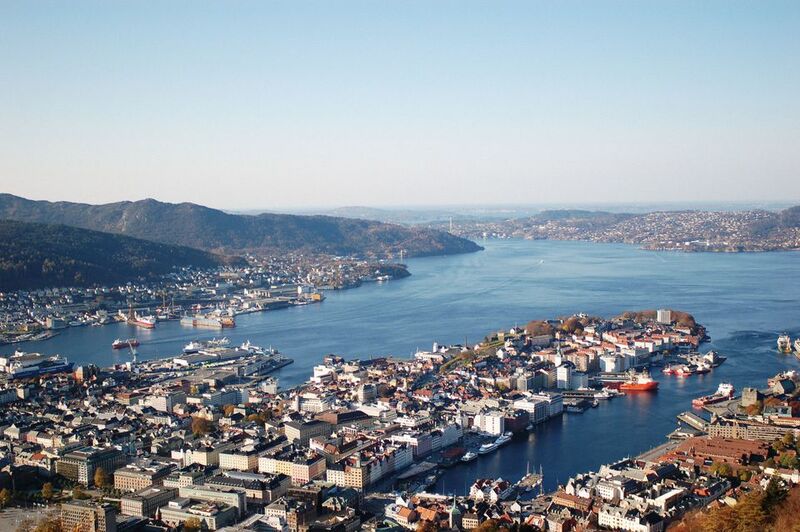 Needless to say, Bergen is a popular destination in the summer months, but do consider visiting the city in May. When it comes to Bergen's weather, this is the driest month of the year with only 76 millimeters of rainfall. The precipitation is considerably low when you compared to summer and winter. Should the rain get on your nerves, fear not. Bergen is an interesting city with plenty of shops, intimate restaurants, contemporary art galleries and museums to keep you entertained when you wish to escape the gloom. What to Pack: The later in spring you visit, the less you'll need to bring in order to be prepared for the weather. However, while May is the driest month, you can still expect an average of 18 days of rain per month all season long, so you'll still need to bring waterproof shoes and a raincoat if you hope to stay dry. Additionally, you'll probably need to carry a heavy coat until at least mid-April to accommodate for the low average temperatures during the first half of spring. Aptly nicknamed “The City of Rain,” you will not find a place with more plentiful rainfall in Norway than Bergen, which is mostly because the surrounding mountains “trap” rainclouds over the city year-round. As a result, the average annual rainfall total is impressive at 2250 millimeters (88.58 inches), and rainfall is a part of the daily lives in Bergen. However, the city is making the most of these of these conditions, even marketing the frequent showers as their claim to fame. Like most of the world, Bergen has also been the survivor of a series of natural disasters. Rainfall and heavy winds are steadily on the increase, and in 2005, shower storms caused several floods and landslides within the city limits. Due to climate changes, severe storms will only become more powerful, not only in Bergen but in surrounding countries in years to come. As an immediate response to the 2005 disaster, the local municipality created a special unit within the fire department, a 24-man rescue team that was formed to respond to any landslides and natural disasters as they arise. Additionally, the city is regularly flooded at extreme tides, and it is speculated that as the sea levels rise, flood intervals will increase as well. Suggestions to prevent this from happening have been laid out, including the possibility of erecting a retractable seawall outside the Bergen harbor. However, regardless of the weather-related dangers, Bergen might face in the future, it is a unique city of almost unsurpassable beauty and unique weather conditions. The contrast between the mountains, the city, and the sea will take your breath away.